Roughly 6 million students attend K-12 public schools in California, and about 2 million students are in community colleges. Many students are taught in old buildings and classrooms that need to be replaced or at least fixed up. Other students live in growing communities where new schools are needed. 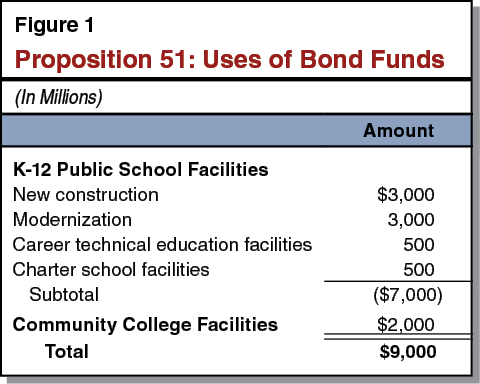 Proposition 51 wants to address these needs by allowing the sale of $9 billion in general obligation bonds to pay for building and modernizing K-12 and community college facilities. It’s the first school bond measure on the state ballot since 2006. It’s unusual because it’s sponsored by the building industry. Typically, the Legislature would be the path for getting this kind of proposition on the ballot, but it hasn’t been able to do so in recent years. About $7 billion (nearly 80 percent) would be allocated for K-12 public school projects. These include brand-new construction as well as modernization of older buildings, with things like air conditioning, new roofs and upgrading security. Roughly $2 billion would be allocated for community colleges. That money could go toward any facility project, including buying land, constructing new buildings, modernizing existing buildings and purchasing equipment. In order for a K-12 public school district to get the bond money, it would submit its proposed project to the state’s Office of Public School Construction. A community college would go through the California Community Colleges Chancellor’s Office. * In most cases, approved projects will require that the district or community college provide local funding as well. From 1998 through 2006, voters approved four state facility school bonds that provided $36 billion for K-12 schools and $4 billion for community colleges. Voters haven’t seen a state school bond measure since. As a result, California has almost no money left for these kinds of projects. Prop. 51 would replenish the state’s coffers. However, the Legislative Analyst’s Office calculates that if it passes and the $9 billion in bonds were sold at an average interest rate of 5 percent, the total cost to pay off the bonds would be $17.6 billion -- $9 billion in principal plus $8.6 billion in interest. Critics of the measure argue that developers and home builders aren’t being required to pay enough for school construction costs. * Opponents include taxpayer advocates. Gov. Jerry Brown hasn’t taken a position, but in the past has been critical of this approach to funding school construction projects. Supporters include developers, builders, school board officials and business groups. *This article has been updated to correct how community colleges would apply for Proposition 51 funds and to add information on how much developers or homebuilders would be required to pay for school construction.